Samba sadam and chidambaram gotsu are inseparable speciality pair of Chidambaram. 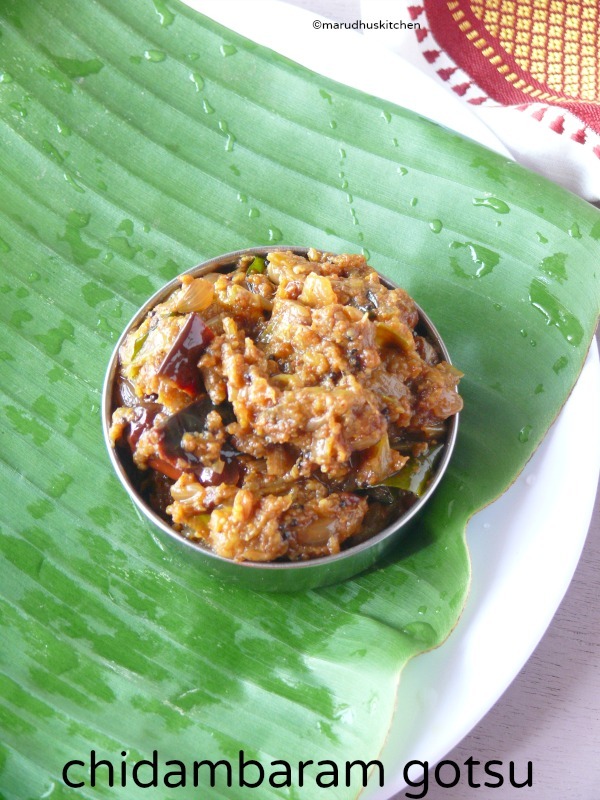 This classic gothsu pairs very well with idli or dosa.Its never a complicated dish to make and using small onions gives a special taste to this dish. Recently,I saw the making of Gotsu and samba sadam in a popular tv show and tried chidambaram gotsu recipe alone.You can even roast brinjals in open fire remove the skin and grind. This will give a smoky flavour to the dish.But ,I have done the dish as shown on that tv show.This masala powder can be done in advance so that it will be handy to do when in a hurry.A special flavour comes to this chidambaram gotsu recipe from adding gingelly oil so,avoid using any other oil.I added jaggery but if you don’t like avoid adding it.While adding tamarind water adjust for tanginess accordingly and add the extract. 1.First keep kadai with little oil add “to roast and grind ingredients “ one by one fry golden. 2.Grind this coarsely and keep ready. 3.Next again keep kadai with oil add small onion,when its transparent add cut brinjals with turmeric powder. 4.Keep on cooking till brinjal shrinks and colour changes(half-cooked). 5.Grind this coarsely adding little water and keep ready. 6.Keep another kadai add Gingelly oil add mustard to splutter. 7.Add urad,bengal gram dal to be golden. 8.Then add curry leaves,dry chillies then asafoetida water. 9.Add coarsely ground brinjal onion mixture then add tamarind water. 10.Add some water,salt and jaggery,let it boil and cook for 5 minutes(adjust the consistency as required). 11.Now add the ground dry masala powder and let it boil till oil oozes. 12.Serve with samba sadam,idli or dosa. First keep kadai with little oil add “to roast and grind ingredients “ one by one fry golden. Grind this coarsely and keep ready. Next again keep kadai with oil add small onion,when its transparent add cut brinjals with turmeric powder. Keep on cooking till brinjal shrinks and colour changes(half cooked). Grind this coarsely adding little water and keep ready. Keep another kadai add Gingelly oil add mustard to splutter. Add urad,bengal gram dal to be golden. Then add curry leaves,dry chillies then asafoetida water. Add coarsely ground brinjal onion mixture then add tamarind water. Add some water,salt and jaggery,let it boil and cook for 5 minutes(adjust the consistency as required). Now add the ground dry masala powder and let it boil till oil oozes. 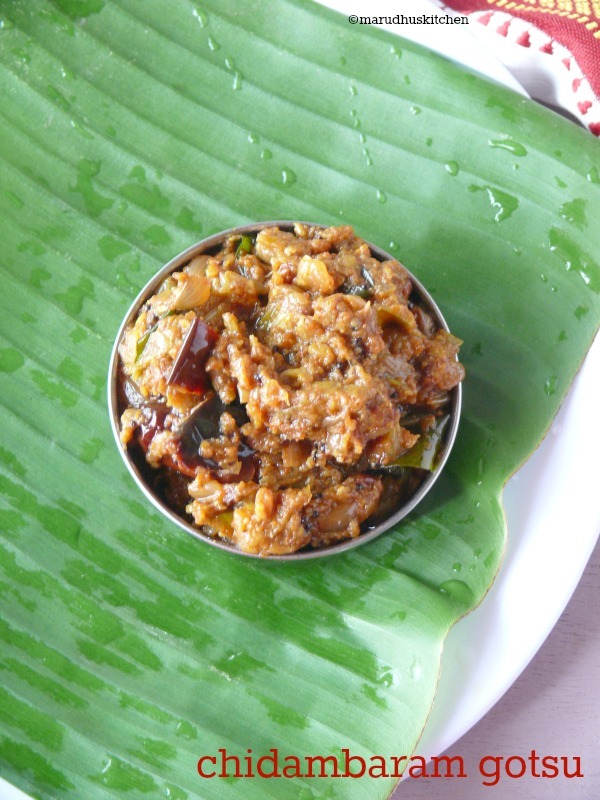 Serve with samba sadam,idli or dosa. Adding jaggery is totally optional. Adding small onions is trademark for this recipe. While grinding don’t grind to a smooth paste,it should be coarse. Use Gingelly oil for exact taste. Looks delicious & thanks for sharing it. Yummy!! I too make it the same way!! Looks very delicious…very close to a chutney I make…Love your version dear!!! This is so new to me, but sounds like a great pairing for idlis. Yummy share.